✦OCA2 is the gene that codes for the production of P protein, an essential component in melanin production. Melanin is the pigment which gives human skin, hair and eyes darkness and color. OCA2 is therefore essential in determining whether our eyes are blue or brown, how dark our skin is, the color of our hair and more. ✦The full name of OCA2 (oculocutaneous [eye and skin] albinism 2) refers to how the absence or malfunction of the OCA2 gene causes the condition of albinism, as seen in the image to the left, where the skin, hair and eyes lack pigment. ✦ OCA2 produces P protein, which is used in melanocytes, specialized cells that produce melanin. Melanin not only gives hair, skin and eyes their color but is found in the retina, where it plays a role in normal vision. 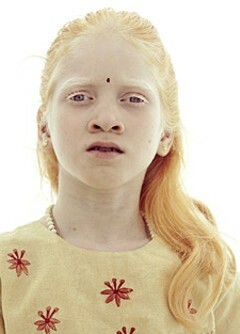 As a result albinism is a potentially dangerous condition, increasing the incidence of skin cancer (melanin normally protects against the carcinogenic effects of ionizing UV radiation from the sun) and vision problems. ✧ What chromosome is the gene on? What is the cytogenetic location? Chromosome 15: base pairs 27,754,874 to 28,099,336. The cytogenetic location is on the long q arm. ✧ How was the gene discovered and located on the chromosome? Danish scientist Hans Eiberg discovered the gene at his lab in Denmark 1996. Using the Copenhagen Family Bank, a massive genetic database with detailed information on over 6,000 Danes, Eiberg found a family with three generations of blue-eyes. Examining DNA from their blood, he found the common factor among the three: the OCA2 gene. ✧ What protein does the gene encode for? What does this protein do? How does it function? OCA2 encodes for the P protein, located in pigment-creating cells called melanocytes, and is essential for melanin production. It's exact function is unknown, however, P protein may be key to the transport of the amino acid tyrosine, which is a precursor to melanin production. It may also be a regulatory protein involved in the pH and maturation of melanocytes. ✧ How does the protein act within the cell? How does this affect the body? Its possible that P protein acts as a regulatory gene, transporting molecules in and out melanosomes--the structures that produce melanin. Also considering the importance of pH levels in biological functions, P protein may be involved in maintaining the relative acidity of melanosomes. ✧ Does the gene affect other genes? Yes. Eye color in particular is a complex trait, and OCA2 only directly affects whether an individual has blue or brown eyes, two colors caused by melanin levels. Other colors like green or hazel are affected by another pigment altogether, lipochrome, and need other genes to activate to be expressed. OCA2 doesn't act in isolation to produce blue or brown eyes, however. Studies have located transcription factors within the HERC2 gene that act as inhibitors of the OCA2 gene, thereby reducing melanin secretion and causing the expression of blue eyes in humans. 1) Gey might be a weaker form of OCA2. It tells the stroma to make some melanin but not as much as the stronger OCA2 gene. The end result is green eyes. This would predict that people with green eyes would have a blue eye OCA2 gene. 2) Gey might be a gene whose job is to make OCA2 not work so hard. Now you would have less melanin in the stroma and have green or hazel eyes. This would predict that green eyed folks would have a working OCA2 gene. 3) Gey might be able to turn on a shut off OCA2 gene. Maybe it makes a protein that can sit in front of the OCA2 gene and turn it on. This protein isn't as good at directing the cell's machinery and so OCA2 wouldn't be on as high as it is for brown eyed people. This would predict that green eyed people would have blue eye OCA 2 genes. ✧ What is the gene’s evolutionary history? Are there related genes in other organisms? How does the gene function in other organisms? Considering that many pigmentation related phenotypes are controlled by a few sets of genes, including OCA2, it's likely that they all originated from one variant of the gene that was favored by natural selection. It seems likely that the variant of OCA2 for light colored eyes became pervasive in the last 10,000 years. Mutations in HERC2, a gene related to the expression of OCA2, are found in most people with blues eyes. This suggest that they share a common ancestor; the global distribution today is shown by the blue dots on the right. Similarly, an allele in OCA2 that accounts for light skin is found commonly in East Asia. These cases are represented by the yellow dots. ✧ Are there any medical implications of the discovery of this gene? Is there any gene therapy and/or medical treatment for any condition related to this gene? There are medical implications, because several significant conditions are linked to malfunctions or the absence of the OCA2 gene from chromosome 15. 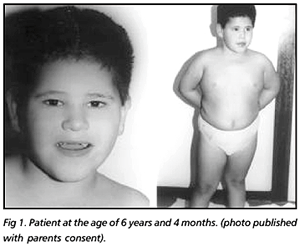 Prader–Willi syndrome is a rare (the incidence is between 1 in 25,000 and 1 in 10,000 births) genetic disorder in which several genes on chromosome 15 (q 11–13) are deleted or not expressed, on the paternal chromosome. It was first described by and named after Andrea Prader, Heinrich Willi et al., in 1956. That particular section of chromosome 15 also contains the OCA2 gene. Symptoms of Prader-Willi sydrome include low muscle tone, short stature, incomplete sexual development, cognitive disabilities, problem behaviors, and a chronic feeling of hunger that can lead to excessive eating and life-threatening obesity. Mutations in the OCA2 gene disrupt the normal production of melanin, which in turn reduces coloring of the hair, skin, and eyes and affects vision. Mutations in OCA2 can therefore directly lead to albinism. The most common OCA2 mutation is a large deletion in the gene, which is found in many affected individuals of sub-Saharan African heritage. Other OCA2 gene mutations, including changes in single DNA building blocks (base pairs) and small deletions, are more common in other populations. Angelman syndrome is a disorder that primarily affects the nervous system, and results from deletions of certain sections of chromosome 15, including the section that contains OCA2. Characteristic features of this condition include delayed development, intellectual disability, and problems with movement and balance. 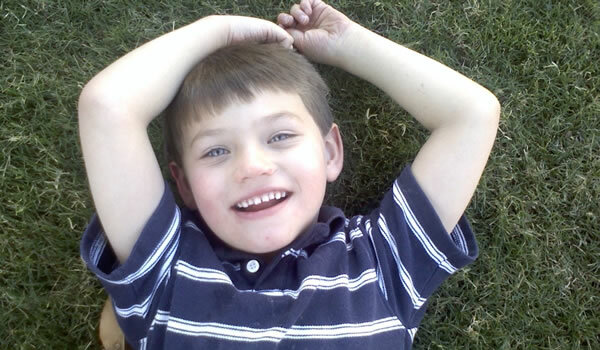 Children with Angelman syndrome also typically have a happy demeanor, hyperactivity, and shortened attention spans. 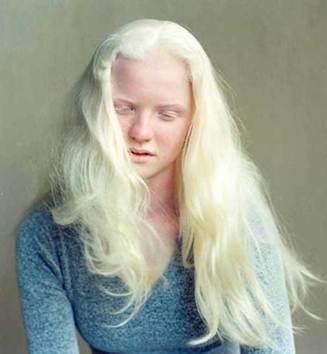 In some Angelman syndrome sufferers, the loss of OCA2 is associated with light-colored hair and fair skin, and lighter coloration is hence a commonly associated characteristic of Angelman sufferers. OCA2 is located on the segment of chromosome 15 that is often deleted in people with this disorder, although it's important to note that the loss of OCA2 does not cause the other symptoms of the syndrome.